The majority of working dog medical issues can be treated efficiently if the handler is adequately prepared and has taken time to learn how to give injections, administer oxygen, and handle the basics of bandage application. Factors such as geography, temperature, and the dog's specific job description will influence how prepared the handler must be. At a minimum, veterinarians recommend K-9 handlers carry a first-aid kit, learn how to give injections, and know how to administer oxygen. A brief session with your veterinarian or even a vet tech should be sufficient to learn how to correctly give injections. K-9s should also wear ballistic vests when practical to protect them from injury in the first place. Allergic Reactions—These can happen to any dog even if no prior allergy has been seen. Most allergic reactions in working K-9s will stem from insect stings from yellowjackets, wasps, and hornets. Signs can range from hives and itching, to more serious signs such as difficulty breathing and collapse. Steroids and Benadryl are used to treat mild allergic reactions while severe anaphylactic reactions should be treated with epinephrine. 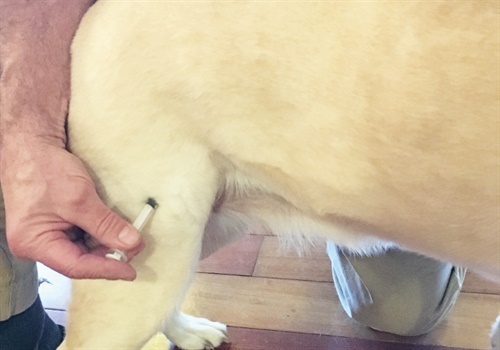 The adult-size epinephrine injecting pen is roughly the correct dose for an 80-pound dog. If you have a working K-9 with a known severe allergic reaction to insect stings, consult with your veterinarian who could supply you with a source of injectable epinephrine for your K-9. Snake venom poisoning is geographically specific, so you should make sure you have the specific antivenin for your particular region. Eye Injuries/Foreign Bodies—Simply having a mild irritation of the eye can be treated initially by flushing the K-9's eye with a sterile eye solution. Foreign bodies such as thorns that pierce the cornea should NOT be removed. Dogs with such piercing wounds should be transported immediately to emergency care. The penetrating foreign material has to be removed very carefully by a medical professional to avoid losing the normal pressures in the eye. Blindness can result from these wounds. Dog Bites—If your K-9 is bitten by another dog, the wound should be flushed with chlorohexiderm or hydrogen peroxide. In general, these wounds are not sutured closed. You can consult with your veterinarian who will likely provide antibiotics and will need to do wound treatment. Lacerations—Clean lacerations can be treated with stapling or bandaging and full treatment can be obtained after the K-9's job is done. However, hemorrhage or life threatening bleeding should be addressed immediately. To be prepared for these situations, handlers should become familiar with pressure bandages and the judicious use of temporary tourniquets. Gunshot/Stab/Impalement Wounds—These dogs should be transported immediately into emergency veterinary care. In general, stab or bullet openings should be packed over with bandaging material and sterile lube. This is of paramount importance in chest wounds where a loss of negative pressure will cause the lungs to collapse. These dogs will almost always need emergency exploratory surgery. Heat Prostration/Overheating—Overheating in working K-9s will happen from either overexertion or, although rare, being left in a cruiser with either malfunctioning air conditioning or inappropriate temperature regulation. Overheating is a life threatening crisis irrespective of the cause. Dogs should be doused with cool (not cold) water and should be transported to an emergency facility immediately for IV fluids and aggressive therapy. The elevation of the core temperature causes a myriad of internal damage to organs and many dogs do not survive. This is a problem best avoided. Bloat/Gastric Torsion—This is a twisting of the stomach that is common in deep chested breeds. It is becoming increasingly common to do a prophylactic stomach "tacking" procedure in working dogs, as treatment in the field is extremely difficult. One preventive measure includes minimizing feeding prior to working but it is not completely clear what the cause of the twist is. The signs of torsion are unproductive retching and abdominal distension. One treatment that can be done in the field is trocarization of the stomach to relieve the distension. This involves inserting a large needle to allow an avenue for the gas to escape, which will buy some time so you can get the dog to emergency treatment. You will need to consult with your veterinarian to learn the correct location to put a needle through the body wall into the stomach. By far, preventive tacking surgery is the best approach for torsion. Choking—All handlers should be proficient in the Heimlich maneuver and its application in the K-9. 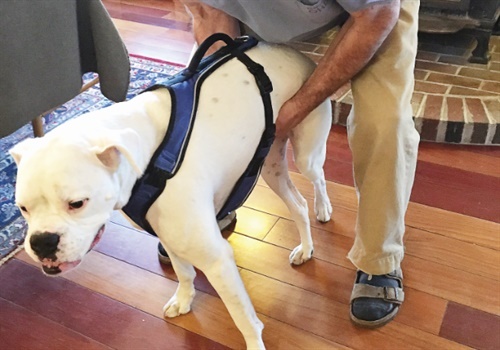 Basically the dog is straddled from over the top and both arms are used to pull the dog's abdomen upward to force pressure on the lungs and hopefully expel foreign material. Alternatively, sharp blows to the chest may be used to dislodge foreign material. Following is a list of supplies for a K-9 first-aid kit. Having a good working relationship with your veterinarian will help in terms of calculating correct dosages and obtaining some of the items that require prescriptions. Oral Poisonings—If you know that your K-9 has consumed a known toxin such as rat bait or sugar substitute chewing gum, you can induce vomiting with hydrogen peroxide or ipecac. About two ounces of hydrogen peroxide diluted 50/50 with water will be effective. Apomorphine is also effective to induce vomiting by either injection or administration onto the surface of the eye. If it is suspected that the dog has consumed caustic material, or extremely acidic material, vomiting should not be induced as that can cause severe burns to the esophagus. Vomiting should also not be induced in a patient that is not completely aware. In instances where vomiting should not be induced, Toxiban can be administered, which can decrease absorption of the toxin. Fractures—Obvious leg fractures can be stabilized in the field prior to transport. Splinting material is commercially available and with a combination of bandaging can stabilize a distal limb fracture. A distal limb fracture is either the radius and ulna or the tibia and fibula. Fractures of the humerus and femur cannot be stabilized by external means. Your dog will be in severe pain with a fracture and a cage muzzle is needed to transport many of these patients. Open fractures with bone ends should be covered with sterile dressings and antibiotic creams. Smoke Inhalation—After removal from a smoke inhalation situation, oxygen therapy by either face mask or flow by is the most important treatment prior to transfer to an emergency facility. Corneal burn can also occur and should be treated with antibiotic salve. Checking the K-9 carefully for burn wounds is imperative and aggressive wound treatment is often required. Opioid Intoxication—It is critical that handlers have Narcan available especially when working with narcotics dogs. While either an intravenous or intramuscular injection is preferred, intranasal administration of Narcan can save your K-9 partner's life. Depending on the opioid to which the K-9 is exposed, Narcan may need to be repeated. The dose of Narcan is about 1.6 mg per 100 pounds of dog. You should have the specific dose your dog needs recorded in your first-aid kit to minimize time after exposure. Any K-9 exposed to opioids should be transported immediately for follow-up emergency care. Cardiopulmonary Resuscitation—It is beyond the scope of a basic article to discuss the technique and dynamics of CPR. 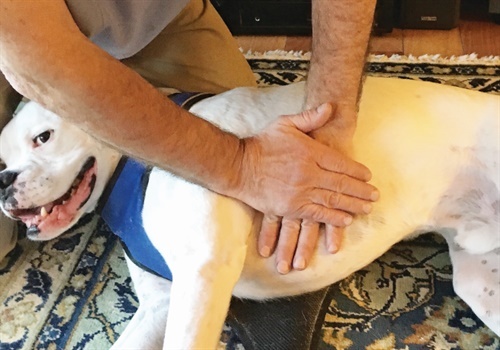 Unless associated with an anesthetic incident causing stoppage of the heart, K-9 CPR in the absence of ancillary therapy will almost always be unsuccessful. That said, it is prudent to learn how to do chest compressions and attempt to restart a heart, but such efforts in the field are mostly for naught. 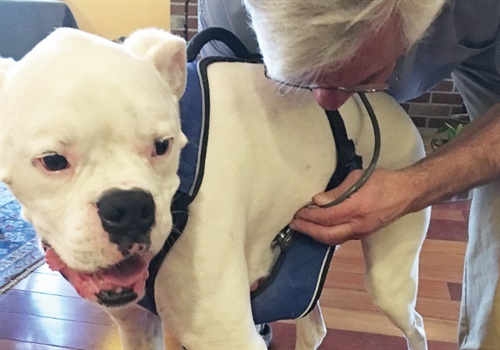 Dr. Robin Zuckerman, DVM, maintains a mobile surgical practice in New England and opened the Emergency Veterinary Clinic in Portsmouth, NH, in 1991. She has been treating working dogs for 30 years and has done many K-9 first aid presentations. She is one of the founding members of the Working Dog Foundation in Portsmouth, NH. She can be reached at [email protected].